Here is the dress with a crinoline (tulle petticoat). Now, I won’t be wearing the petticoat under the dress for everyday life, but I might for more fancy occasions! I took the above picture yesterday, but the rest of the review was written last week. I’m not wearing the petticoat in the pictures below. I’m afraid none of the pictures do the fabric and dress justice. The fabric is stunning in real life, with its embroidery and appliqués. Friends, I had to call this dress after Summerset. Not only does she inspire me daily to keep pushing myself and striving for quality sewing – but her vintage projects remind me all the time how much I love the fifties fashion! And how I should sew more vintage patterns. So, there you go, Summerset. I hope the dress deserves wearing your name. Dresses have empire waists and gathered bodices. The dresses’ skirts are shaped by pleats, and come in full and slim skirts. Optional belts for views A and B. The bodice is fully lined. I made view C, the full-skirted version. 6-14. I made a 6 all around except for the front bodice which I graded into a 10. The instructions were excellent. The writers made an effort to add useful tips on top of the basic construction instructions. I’ve always liked jumpers: they mean you can wear a pretty dress but still stay warm in winter because you can layer it. I’m glad that jumpers are back into fashion! I am fascinated by the fifties fashion. Finally, I really, really like how the waist is shaped with all those darts. I am so grateful to Simplicity for re-releasing that pattern! Merci, Simplicity ! Dislikes: The empire seamline was too high, and I found the armholes were too narrow, as well (too narrow to wear a blouse or a top underneath anyway). See alterations section below. This was my splurge of the season. 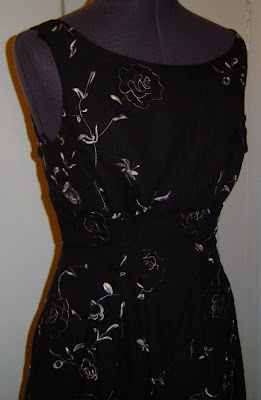 I bought a black suede embroidered and appliquéed with flowers, in a variegated black-grey-white thread. I really loved that pattern and wanted a fabric to match, as this was meant to be the piece de resistance of my autumn/winter wardrobe. Using suede was a first for me. I so did not want to mess it up! This is why I basted everything by hand beforehand. I was afraid ripped stitches would leave small holes in the fabric so I wanted to avoid having to rip seams. Making a muslin and hand-basting the dress were therefore compulsory! Since some flowers are appliqueed on the fabric, I had to cut out those which were located on seamlines or which would be enclosed into the darts. I realize in the pictures that the hem seems uneven at places where there are flowers on the fold of the. I need to press the flowers to the inside. The dress’s success depends largely on the darts’ accurate shaping, in my opinion. This is why I used the tip Christina posted on her blog about basting darts with a ladder stitch (thanks again, Christina!). The process was time-demanding, but the result was perfect! A close-up of the bodice so you can see the fabric and details at the bust. Yes, I altered the pattern somewhat. – As always, I cut a six for the back. I cut either a 6 or an 8 for the waist and hips, and my muslin revealed a 6 was better all around this time. I cut a 10 for the bust and graded the pieces’ lines. – The empire waistline seemed too high to me, and an entry on Sew Retro confirmed my doubts. I made a muslin of the upper bodice and ended up adding 1.5 cm (5/8″) in height. designed to be worn over a top. I therefore added 1 cm to the shoulders, back and front. You may want to consider this if you plan on layering this with a blouse that has wide sleeves, like the one I’m wearing in the picture. – Petites beware! It was a nice surprise to see that the pattern came with an optional petite adjustment. However, even with the adjustment, I still needed to remove 13 centimeters to the bottom hem to have the same length as in the model picture!! That is more than 5 inches. OK, I know I lengthened the bodice, but by only 1.5 cm (5/8″). Okay. I very rarely sew patterns twice – there are so many out there that I want to try! Besides, this one was very work-intensive because I so wanted to do it right. While I was sewing it, I wasn’t planning on sewing it again. BUT. But, once I’d tried it on for the final fitting, I thought, now I want one with the slim skirt! So we’ll see about that. I would like to sew it again – now to see if I manage to fit another version into my ever-expanding list of projects! I warmly recommend the pattern… but I also warmly recommend you make a muslin of at least the upper bodice. This is truly a beautiful pattern. I had high hopes about that project, and am not disappointed in the outcome! Even with that beautiful fabric, the dress ended up costing less than 30 euro (including the price of the pattern). I didn’t even pay that in reality, because I had a 15 euro coupon at the store when I bought it! I don’t think it’s that bad considering the price of RTW today! And this is not RTW, of course. 🙂 I really like the combination of a vintage patten and a fashionable fabric. ETA: I wrote that review last week, but Summerset started posting a series of posts comparing the Simplicity 2007 re-release of the pattern, and the original pattern. I find it fascinating. In particular, what I altered in the pattern (high bustline, narrow armholes) was even more emphasized in the original pattern. I stated the instructions were excellent; but the earlier instructions were apparently even better, giving tips for a more couture finish. (ps: I might look a bit like a little girl with that blouse. That is Seb’s opinion anyway. But I don’t really care. That blouse is one of my favourite garments ever. I bought it for a pound in an op-shop in England when I was 14! The sleeves are cut in eyelet fabric and the princess seams and collar are gorgeous. Can you tell I was already fascinated by interesting fabrics and tailored details? 😉 I’ve worn it a lot over the past 11 years, but have taken care of it, too. In closing: I am meeting Tany from Portugal today!! She is spending a few days in Paris and we’re going fabric shopping and having lunch together. Can you believe it? I can’t get over how fortunate I am to be meeting her. What a lovely, lovely dress. The petticoat version is wonderful for a special occasion. And imho you rightly named it Summerset.Hope you had a great day with Tany. What a gorgeous dress! And it looks amazing with the petticoat – so retro. Your extra time and attention to detail really paid off. Another beautiful dress my friend. It is perfect!! You are an amazing seamstress Izzy. I am very honored to have a dress named after me! Thank you! It’s a surreal type of experience to see your own name in a blog title.You have done a marvelous job with the jumper. The fabric is just so beautiful and is perfect for a major portion of a winter wardrobe. You will get a lot of use out of the garment. Let me say, I am so *jealous* that you get to meet and shop with Tany! Have a lovely day together! You look adorable in your new dress. The fabric is really beautiful! Beautiful dress – and it is beautiful on you! I rather like your blouse with the dress too.I hope you and Tany took pictures of your day together. Gorgeous dress, fit is so excellent! I think that grey knit turtleneck would be very chic with it also. Oh my goodness!!! Lucky you and lucky Tany! Have fun and do show us what you purchase. Now to that dress….you have done the most beautiful job. If only the photography could catch the fabric better. My screen does not do it justice for sure. Gorgeous sewing as always Isabelle. The dress is beautiful. Isabelle, your dress is stunning. I love it and it looks fantastic on you. Have fun with Tany. I loved the dress with the petticoats. Its a fab, Isabelle.Another beautiful finished.Have a wonderful time with Tanya. This is gorgeous and you look lovely in it. I like it with the blouse underneath, too. Hello my dear friend.That dress is very beautiful, I like it with the petticoat very much ! You can tell Seb for me that with this dress in blue fabric and fair hair, you would be a perfect Alice in Wonderland …But in black, this is perfect for an active young woman !Big kisses ! Gorgeous! It looks amazing on you too!! I wish I could feel the fabric as it looks just fabulous. I love the version with the petticoat under it…what a great evening dress that makes. I guess this is one very versatile dress pattern since you have shown it two different ways…and I am loving it on you. You have done an amazing job with such a simple pattern. Love your choice of fabric and the detail finishes. Can’t wait to see the straight skirt version. I do think that a grey knit top would be perfect with some boots for those cold winter days. Enjoy your shopping trip with Trini. Oops! I meant to say enjoy your shopping trip with Tany. Sometimes my fingers go too fast when typing. Thank you for the great review. Your dress is absolutely beautiful! I love your choice of fabric. I’m in the process of fitting the muslin and selecting a fabric for view B.
Isabelle your dresses are simply fabulous looking! Great work! Wow! Just wow! Oh, and I would wear that crinoline everytime I wore the dress. I really love this dress/jumper. It is so versatile. You did a great job!!!! How gorgeous! You got a great bargain on that suede, too.I’ve just bought that pattern, so I really appreciated your review- and the links to Summerset’s comparison posts.Thank you! I love the dress! It looks fantastic on you! This dress is so beautiful. So 60’s!!! What a gorgeous dress! The fabric is so yummy!